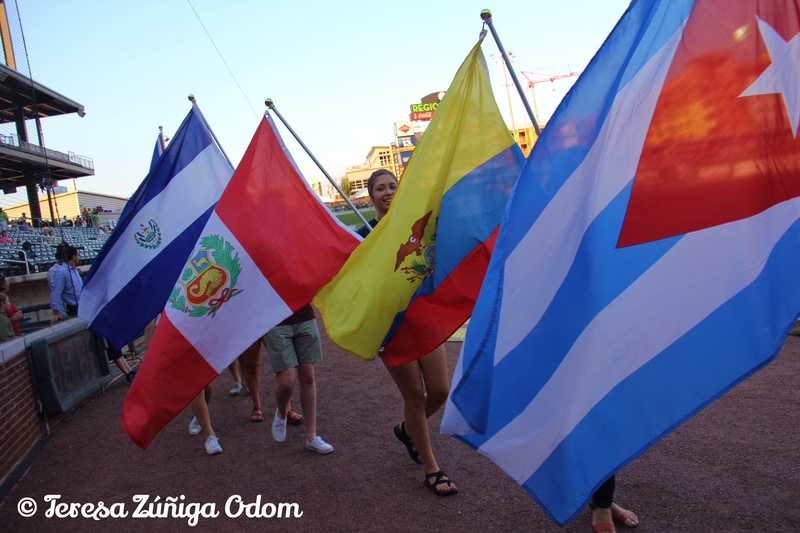 Students from Samford University Latin American Studies take to Regions Field for the parade of Latin American flags at Fiesta Night with Los Barons on August 27. It was a beautiful afternoon…the weather was great, sun shining and a slight breeze found its way through the park every so often. I thought I was arriving at the park early to help Fiesta’s event manager extraordinaire, Denise Koch, put Fiesta flyers in all the cup holders at Regions Park. I should have known better. Denise had been hard at work since early that morning on Fiesta Night with Los Barons and had everything under control. I “did” manage to wrestle a small stack of the flyers away from her and finish up one section so she could take a break. 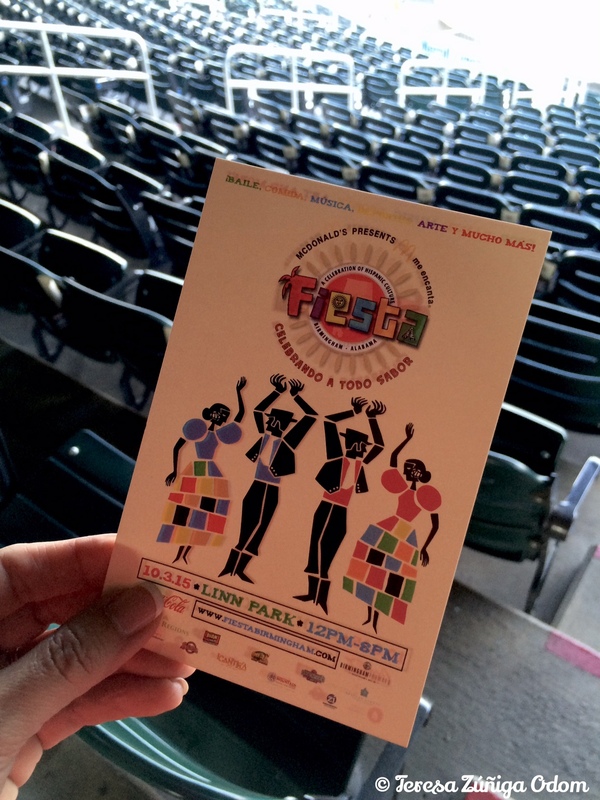 These Fiesta flyers were placed in every cup holder at Regions Field. 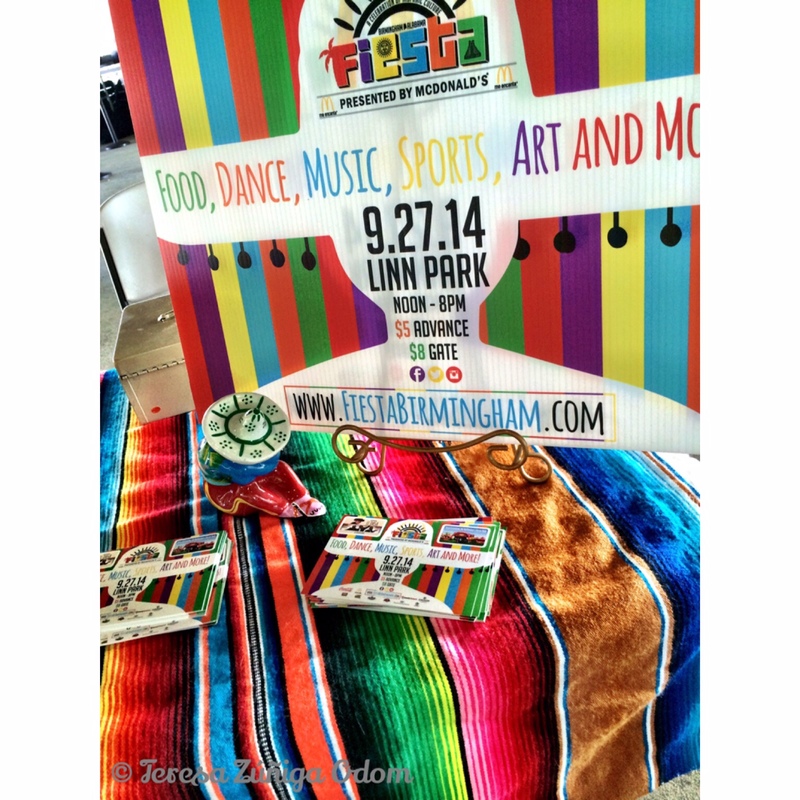 Fiesta and the Birmingham Barons partnered for a second year to bring a Latin flair to the ballpark this past August. Our thanks go out to the wonderful people at the Birmingham Barons, in particular, John Cook, Director of Sales, and Don Leo, Corporate Sales Manager, with the Corporate Partnerships Department, for all they did to make our time there so enjoyable. Mike Suco, one of Fiesta’s founding board members poses with his son Mikey, and Barons Staff Members John Cook and Don Leo. Once again, we had students from Samford University’s Latin American Studies participate in the parade of Latin American flags. We even had a few sponsors get into the act which thrilled us! Our sponsors from BB&T and Regions Bank both grabbed flags and made their way around the infield with the students and Fiesta board members. It was such a beautiful sight! Next, Don Leo introduced Fiesta and a short video of last year’s event was shown on the big screen. The video was produced by board member Orlando Rosa with La Jefa Radio Station. Ever the perfectionist, Orlando mentioned later that he wasn’t completely happy with the video but the rest of us LOVED it! It definitely got the crowd going and gave them a taste of what to expect on October 3rd! 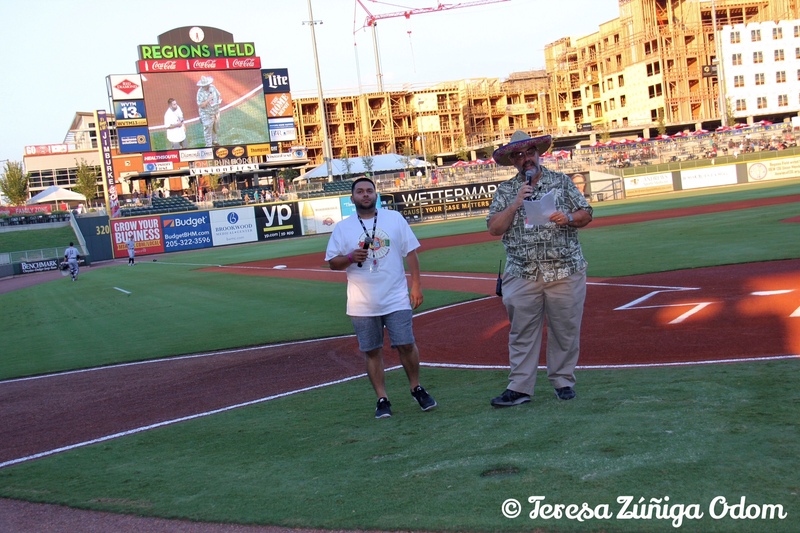 Fiesta board member, Orlando Rosa helps Don Leo of The Barons open up the game festivities in Spanish! 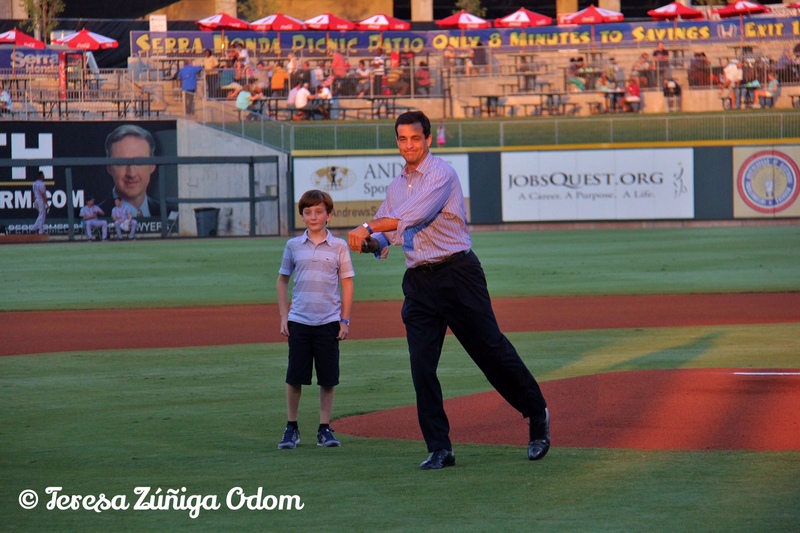 Mike Suco, one of Fiesta’s founding board members was on hand with his son Mikey, to throw out the ceremonial first pitch. Mike didn’t miss a beat and never lingered on the pitcher’s mound. He threw out the perfect pitch so fast we almost missed it! Reminded me of the early days of Fiesta when Mike would just get things done! It thrilled us to have Mike and his family with us that night to celebrate and reminisce about Fiesta, especially for some of the newer board members and sponsors who had never met him but heard a few of us talk about him with such admiration over the years. Mike Suco, throws out the ceremonial first pitch as his son watches beside him. As always, we had the opportunity to talk to interested people attending the Barons game about Fiesta and encourage them to get advance tickets to the event. Ronald McDonald came by to represent our Title Sponsor, McDonalds, and had pictures made with kids young and old. I always love it when adults want their picture made with Ronald! I had mine made with him last year! 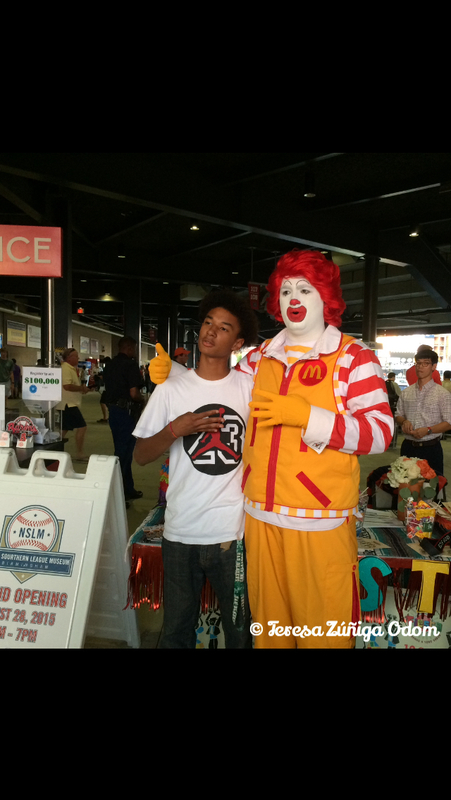 One of the many photos Ronald McDonald took with Barons Baseball game attendees. Don’t forget…Fiesta is Saturday, October 3rd from noon to 8 p.m. in downtown Linn Park! 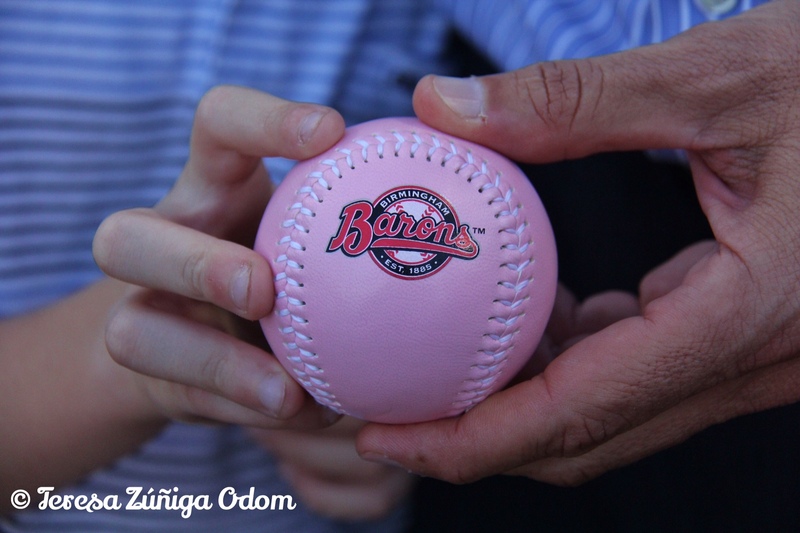 Meanwhile, here are a few more pics from our night with Los Barons! Mike Suco and his son pose with the baseball before the ceremonial first pitch is thrown. We had to get our photo with Ronald too! Left to right – Ronald, me, Vanesa Vargas and Freddy Rubio. 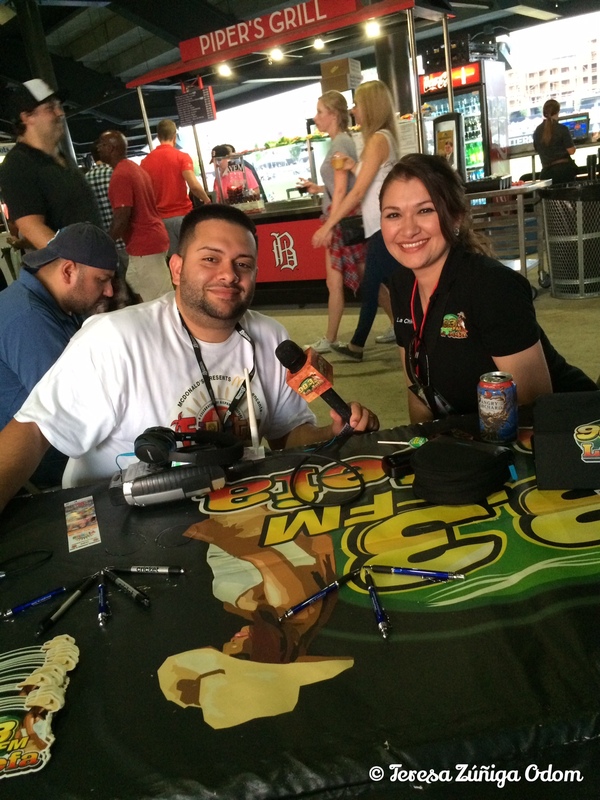 Orlando pulled double duty at the game with a live remote, along with his wife and co-worker, Maria – better known on air as La Chikis! 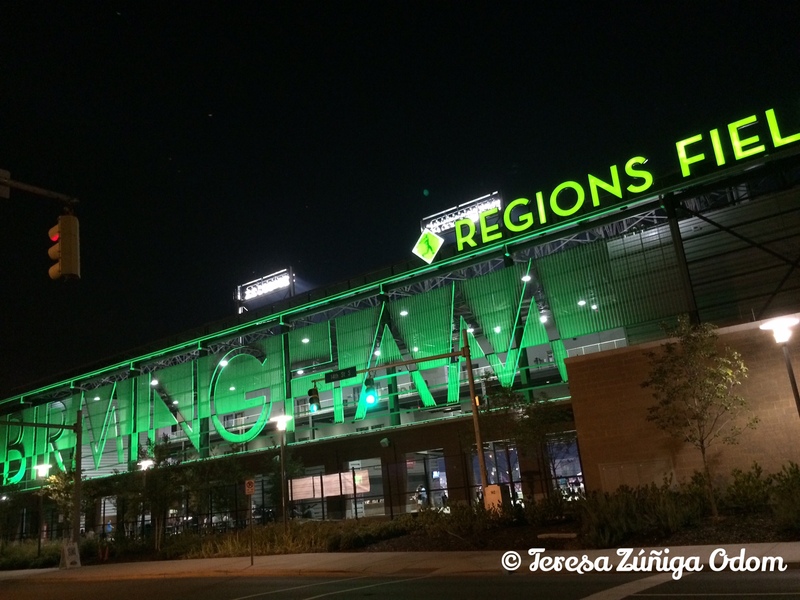 Parting shot of the Regions Field Birmingham sign as I was walking to my car after the game. This is such a beautiful facility. If you’ve never been, you have to check it out! The parade of Latin American flags begins and is lead by the Stars and Stripes of the USA! That’s Fiesta Board member, Vanesa Vargas with the Fiesta sign in front! This entry was posted in Baseball, Birmingham, Birmingham Barons, Festival, Fiesta, Regions Park and tagged Birmingham Barons, Denise Koch Events, Don Leo, Fiesta, First Pitch, John Cook, La Jefa, Linn Park, McDonalds, Mike Suco, Orlando Rosa, Ronald McDonald, Samford Latin American Studies, Samford students, Samford University on September 3, 2015 by Southern Señora. 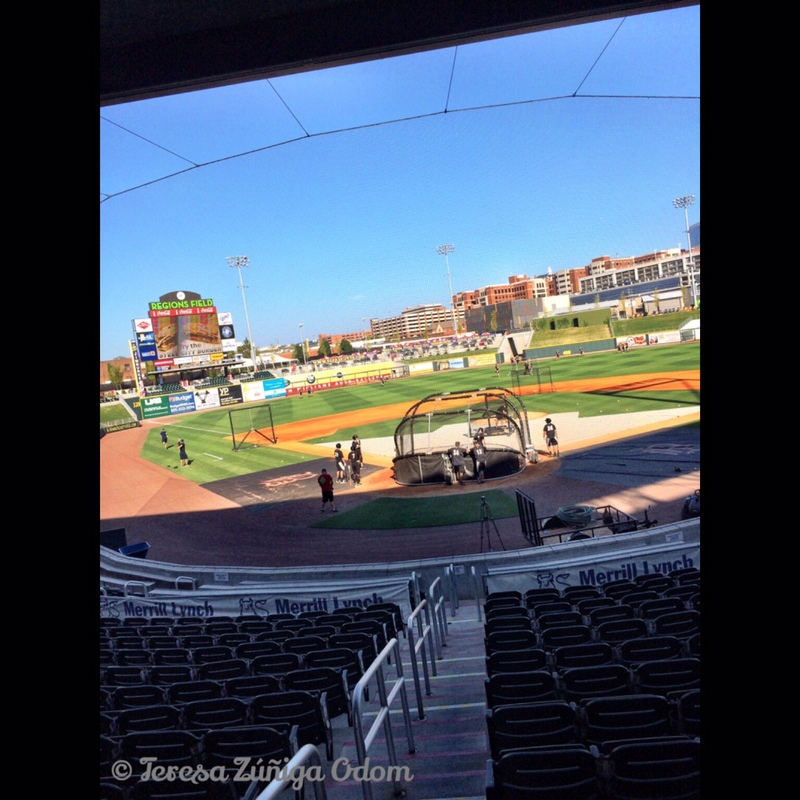 Regions Field and the Birmingham Barons partnered with Fiesta to have Fiesta Night with Los Barons last year. We are gearing up for another fun event this week! 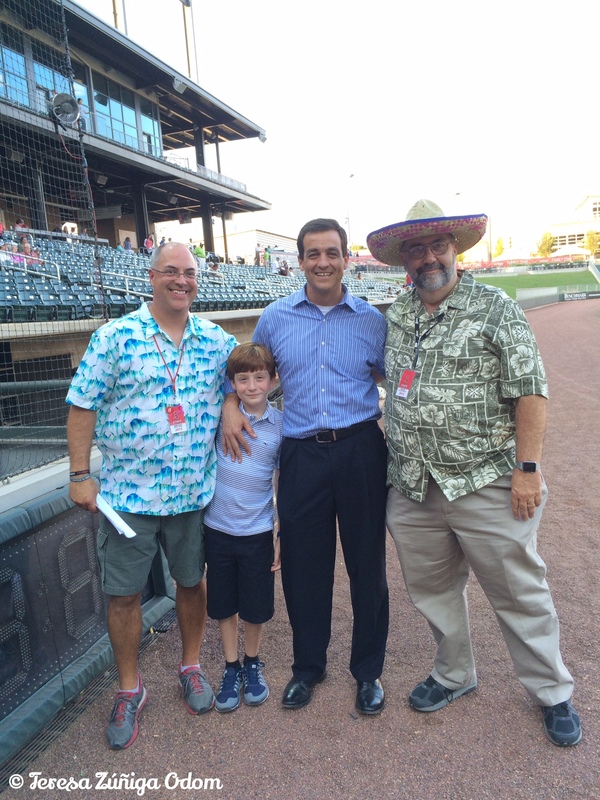 Last year, Fiesta was fortunate to partner with the Birmingham Barons for a night of baseball with a Latin flair! Fiesta Night with Los Barons was the perfect prelude to Fiesta 2014 and was so much fun to pull together and attend! 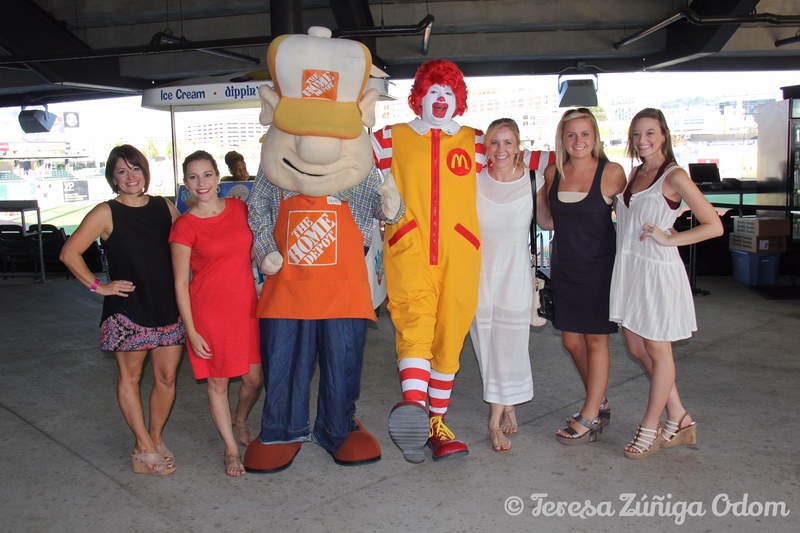 Ronald McDonald posed for pictures with fans and The Home Depot mascot made an appearance too! Fiesta board members and volunteers arrived early that evening to fill the drink cups with flyers about that year’s event. Later, they staffed a table to pre-sell tickets to Fiesta and answer any questions about the festival. Our presenting sponsor, McDonalds was on hand to participate in that night and brought along Ronald McDonald who joked with the crowd and posed for pictures with everyone. 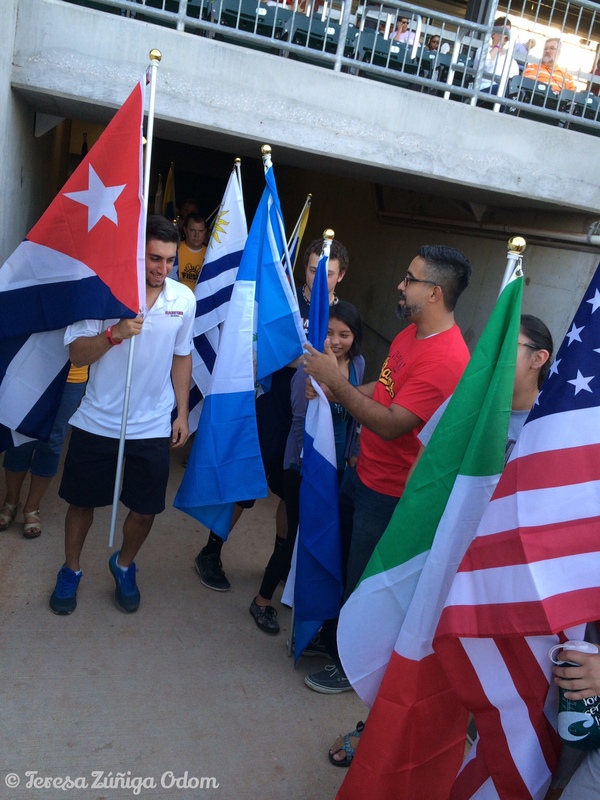 Samford Students participated in the Parade of Latino Country Flags before the beginning of the game. 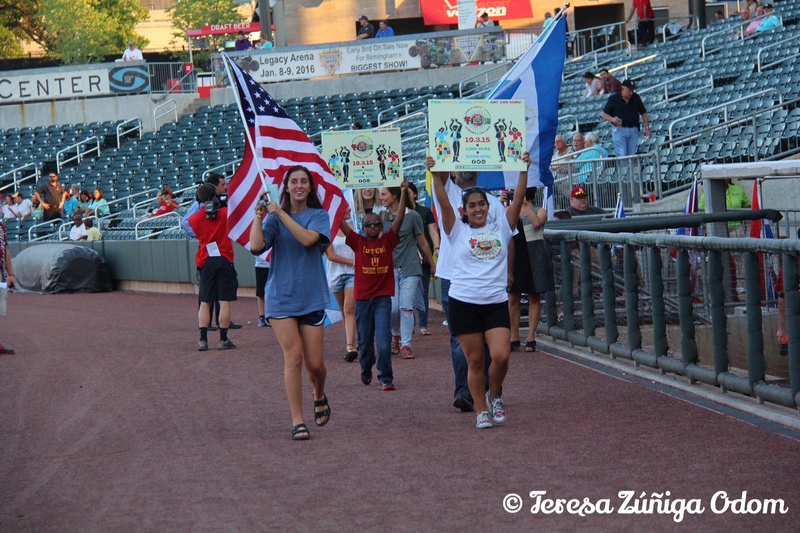 Before the first pitch was thrown out, we arranged to have students from Samford University walk onto the field in a parade of flags representing about 15 Latino countries. So colorful! The students were later on hand for a check presentation photo when Fiesta awarded $5,000 to Samford University for Hispanic student scholarships. Carlos Aleman, Professor of History accepted the check along with students from the newly formed Samford University Latino Student Organization. It was so exciting to see the students and have them participate! And I have to say that just a few short months later, the Fiesta board asked Carlos to become a board member and he graciously accepted! We are fortunate to have him on board with us! 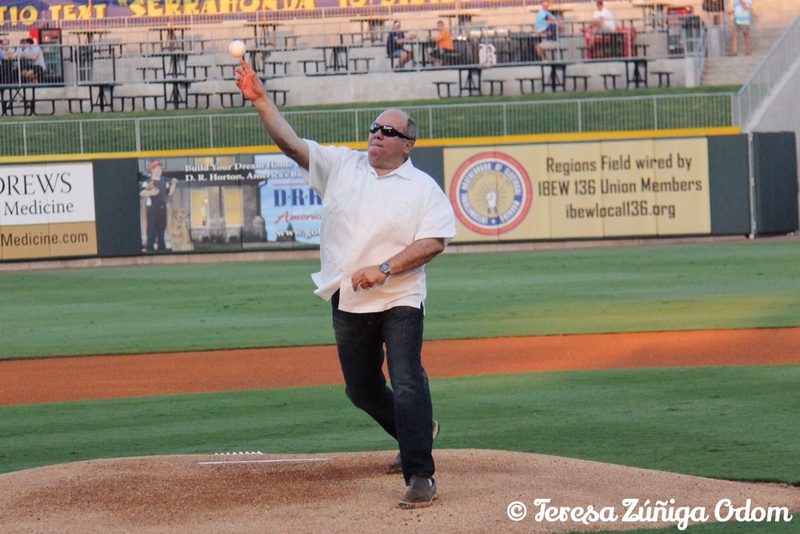 McDonald’s Owner and Fiesta Title Sponsor, Santiago Negre did the honors by throwing out the first pitch at the game. After the parade of flags, it was time for the first pitch. Fiesta asked Santiago Negre, local McDonalds store owner and Title Sponsor of Fiesta, to do the honors. Santiago and his brother, Russell, have been wonderful to Fiesta and they are back this year (2015) as Title Sponsor once again! We are so fortunate to have them in Birmingham, not only for their Fiesta sponsorship but also for all the wonderful things they are doing for our community and city and always with such enthusiasm. Santiago joked about his form and how he would throw the baseball as he went to the mound and then proceeded to throw out the most perfect pitch! It was great to be on the field when this was happening and feel the excitement around us. Santiago definitely made us proud with that pitch and we certainly let him know! The traditional race of the mascots was interesting too. From what I hear, the Hot Dog always wins and the Taco is left in the dusk. Well, this year we had Ronald McDonald running a little interference for the Taco and it won!!! That was quite a thrill for us, believe it or not! Later we all grabbed a beverage – it was Thirsty Thursday after all – and enjoyed the game. The weather was beautiful that night and the crowd was great. Hopefully, we were able to reach some people who didn’t know about Fiesta and encourage them to attend last year. 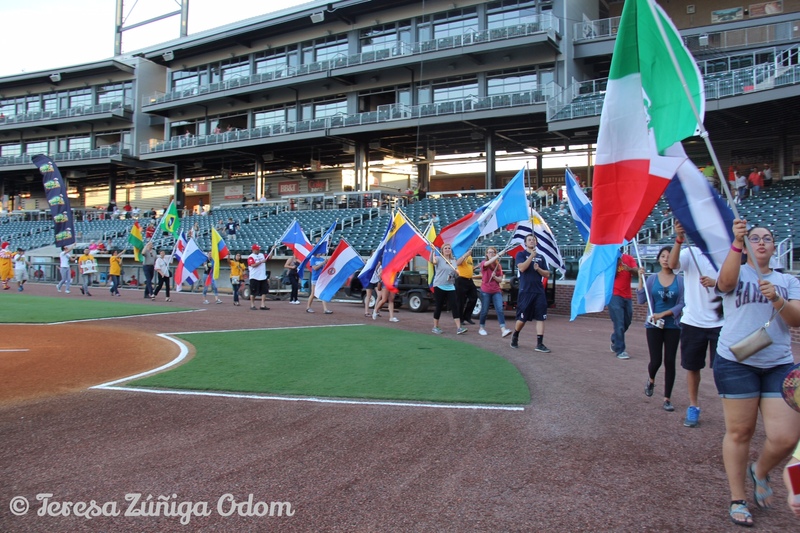 If you are in town this week, come on out to Fiesta Night with Los Barons THIS Thursday, August 27 – Regions Field at 6 p.m. Fiesta tickets will be on sale and you won’t want to miss the Parade of Flags again. We also have a special guest who will be throwing out the first pitch! 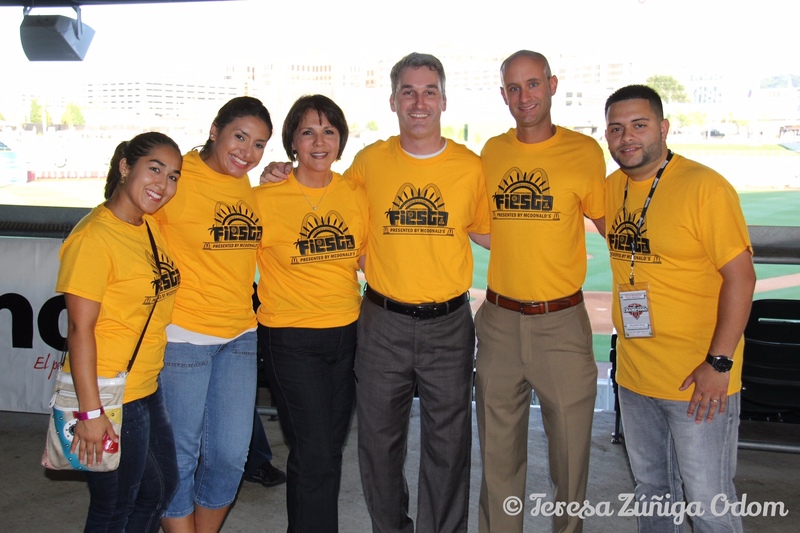 More on all this in my next post – Part 2 of Fiesta Night with Los Barons! Hope to see you there! 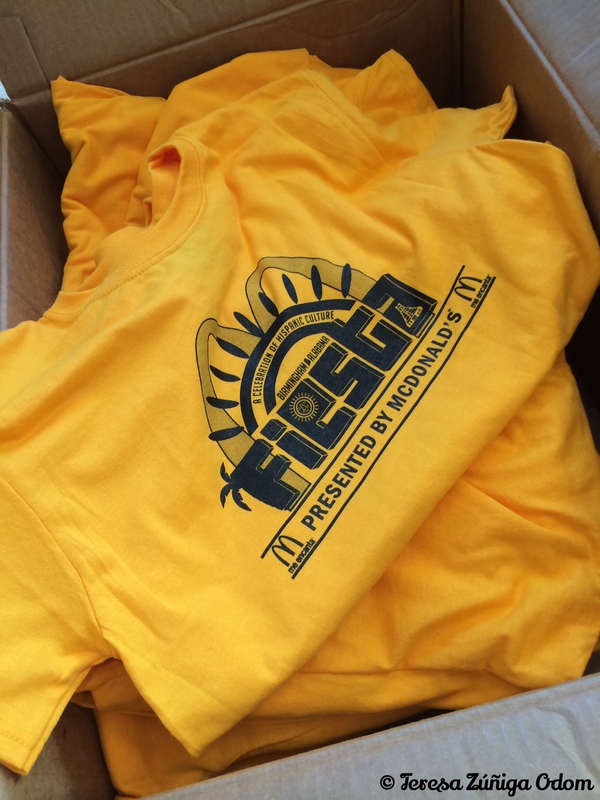 Fiesta Board and Volunteer Shirts for 2014 – the color definitely made us all stand out in crowds! Carlos and the students get ready to show off the flags of Latin countries. 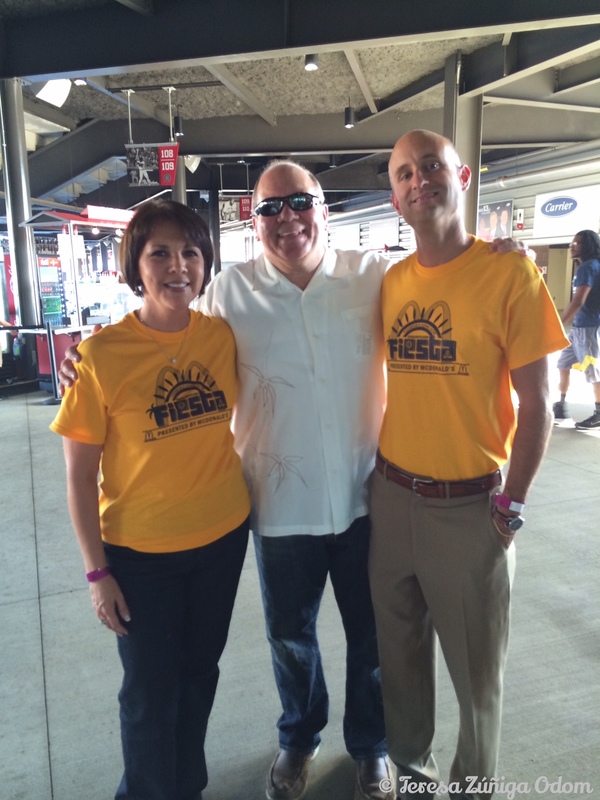 Photo opp with Santiago Negre and Fiesta Board Chair – Matt Ennis! 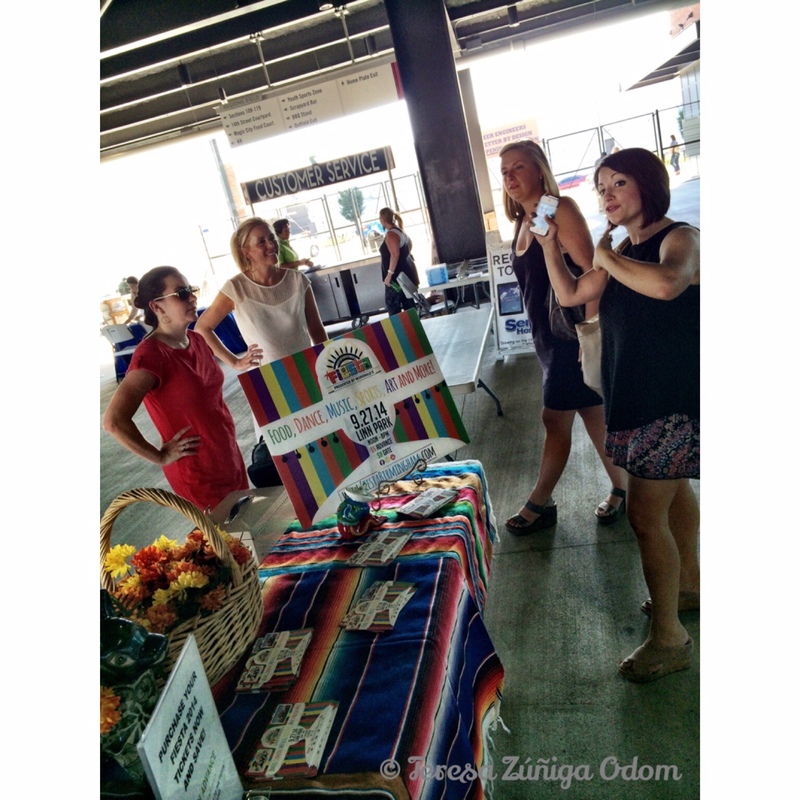 Fiesta Event Manager, Denise Koch (far right), gives last minute instructions as the gates open. 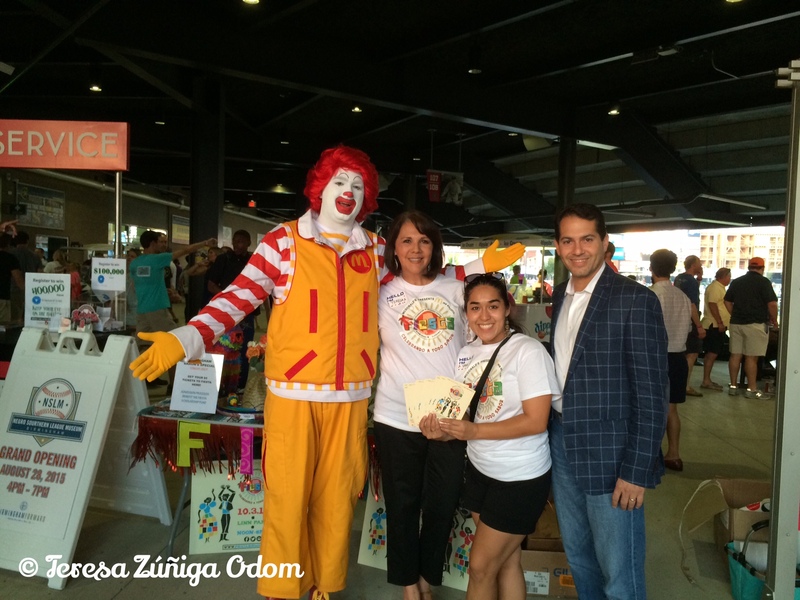 This entry was posted in Birmingham, Birmingham Barons, Festival, Fiesta, McDonalds, Regions Park and tagged Baseball, Fiesta Scholarship, Los Barons, LSO, Regions Field, Ronald McDonald, Samford University, Samford University Latino Student Organization, Scholarship, Title Sponsor on August 26, 2015 by Southern Señora.